The parade of storms off the Pacific ocean continues. Canada is wall-to-wall cool and the jetstream continues bringing one disturbance after another across the lower 48 to the east coast. Friday, we get a day off. Weak high-pressure with seasonable weather, plenty of sunshine north, and many clouds south. Maybe a little light snow near the Connecticut coast. High temperature in the 30s to near 40 degrees. Wind is light and variable. Low pressure over the mid-Atlantic states moves our direction as it get stronger Friday night. 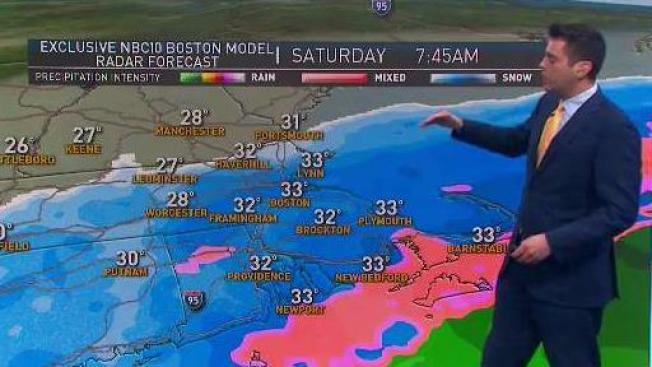 After a dry evening, snow likely develops along the south coast by 2 a.m. The snow advances to southern New Hampshire by sunrise. Snowfall rates of a half inch to an inch an hour will likely yield close to a half a foot of snow for much of southern New England. Not only do we have low pressure passing south of Nantucket late Saturday, but there’s also a front coming in from the west. A separate batch of snow is likely to arrive in western Massachusetts and Vermont by sunset. High temperature Friday in the 30s. Low pressure pulls away from southern New England Saturday night, but that front will generate a period of snow that could add up to a couple of inches in western and northern New England by Sunday morning. We are briefly between systems again for Sunday, with mostly cloudy skies and high temperatures in the 30s. Another low-pressure system goes off the mid-Atlantic coast and strengthens into a gale center near Cape Cod on Monday. That means a more widespread, heavier snow for much of New England, with rain or snow possible along the coast from New York City to Boston. The wind will ramp up with that one, from the Northeast gusting past 40 mph to the coast. It is a potential nor’easter. Some parts of New England may see a foot of snow Monday, followed by colder and drier air coming in Monday night and Tuesday. We may get a couple more quiet days the middle of the week, but it will be cold, perhaps record-breaking cold and parts of northern New England. Another storm system is likely to come in the backside of the cold air late in the week or the weekend. Stay ahead of the action with our First Alert 10-Day Forecast.